After the successful launch of Amar Chitra Katha on Mobile Phone,India’s 2nd largest GSM mobile service operator Vodafone Essar today expand its mobile comics library and introduces new Comics Services dubbed as ‘Chhota Comics’. 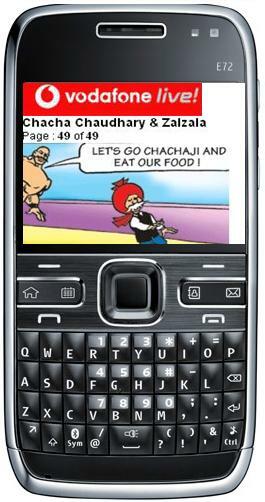 With the Vodafone Chhota Comics service, its Postpaid and Prepaid subscribers can access small comic strips as well as full length comics of popular Indian and international titles like Chacha Chaudhary, Mickey & Donald, Suppandi, Akbar Birbal, Winnie the Pooh, Bal Hanuman and many more direct on their mobile devices. The comics Strips will cost at Rs.2 for small strip and Rs.15 per full length comic. 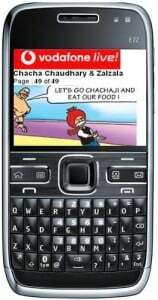 The Vodafone Comic services are available on its GPRS portal Vodafone Live!.To subscribe the service,customer can send SMS ‘COMIC’ to 111 to download the application and purchase the desired comic.Presently over 35 popular titles are available under various categories on Chhota Comics service. Kumar Ramanathan, Chief Marketing Officer at Vodafone Essar stated, “Last year we launched Amar Chitra Katha on Vodafone, which became very popular with our customers. With the launch of ‘Chhota Comics’ service, we aim to further enhance our customers’ experience by providing them with advanced features and more comic categories. You are right it is Voda not our Indian Reliance which provides most of services at cheapest rate. What about the GPRS tariff? will it remain same 10paise/10KB? or Vodafone is coming with some unlimited GPRS plans?